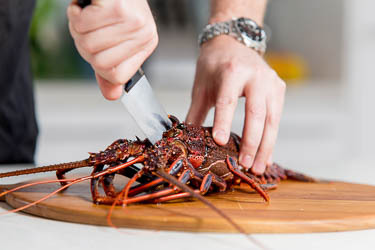 To prepare a split lobster, either cooked or raw. 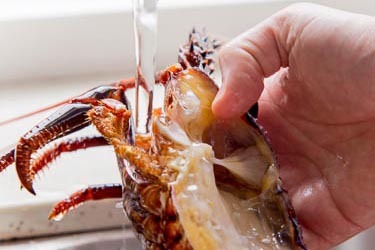 If the lobster is frozen defrost in a bath of cool water for 30 minutes and prepare immediately. 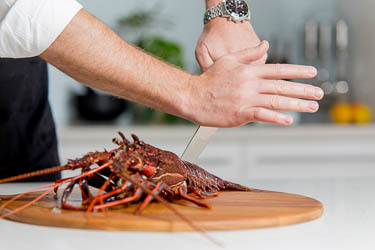 Lay the lobster belly-down on a cutting board and insert a large, sharp knife into the head section with the blade pointing forward. Press down firmly to split the head in half. Unfold the split halves carefully to ensure the head remains attached to the tail. If you don’t want to eat the tomalley, gently wash the head section under running water to remove. If the lobster is already cooked it is now ready to serve as desired. 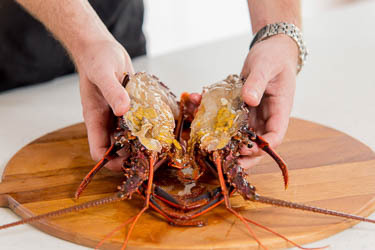 If the lobster is raw, it is ready to prepare according to your favourite recipe.